15 February 2007: Los Angeles Mayor Antonio Villaraigosa has made it one of his goals to transform his city into “the greenest big city in America”. Plagued with traffic problems and the worst air quality in the country, LA is more often equated with urban sprawl and asthma than a model of sustainability. But that transformation is exactly what Villaraigosa and Deputy Mayor Nancy Sutley have in mind. Nancy Sutley is the Deputy Mayor for Energy and the Environment for the City of Los Angeles, and is also Mayor Villaraigosa’s appointment to the Board of Directors for the Metropolitan Water District of Southern California. With a long history in environmental policy at both the state and federal level, Ms Sutley is in a unique position to lead Los Angeles toward sustainability. The majority of energy for Los Angeles comes from coal plants in Arizona and Utah. Currently, only six per cent of LA’s power is renewable (mostly wind power from the San Francisco Bay area). The mayor’s office has set a goal for the city to use 20 per cent green energy by 2010. Is it realistic to jump from six per cent to 20 per cent renewable energy in just three years? In a word, yes. Southern California Edison is building a huge solar farm in the Mojave Desert. New technologies are making solar energy more affordable and less space-intensive. The Los Angeles Department of Water and Power is also working on geothermal projects in the Salton Sea area. LA has also recently embarked on a pilot project whereby bio-solids from local sewage treatment plants are converted into clean energy. Solid waste is disposed in abandoned oil wells. As the waste decomposes, methane is produced. The methane powers a fuel cell, which generates green electricity. Deputy Mayor Sutley explained the continuing need to decrease LA’s demand for energy. One of the most effective ways to lessen demand is embracing green building practices. Los Angeles now requires all new public buildings to meet LEED (Leadership in Energy and Environmental Design) standards provided by the US Green Building Council. Los Angeles boasts seven LEED certified projects, including the Platinum-rated Lake View Terrace Branch of the Los Angeles Public Library. The city also has 59 LEED registered projects, placing it fifth in the US for the highest number of registered projects. 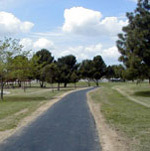 Los Angeles is also working with private developers by providing resources and incentives to build green in the area. The system for supplying and delivering water in California is incredibly inefficient. So much energy is spent treating and transporting water that the Department of Water Services is the largest consumer of electricity in the state. Being among the most arid regions of the state, Los Angeles has a long history of water conservation and has actually managed to do a fair job of it. LA’s water consumption has remained steady since 1990 even with a 15 per cent increase in population. In the mid 1990’s, Los Angeles mandated low flow toilets and showerheads for the entire city. Neighborhood by neighborhood, local nonprofit organizations were enlisted to deliver and install the new toilets  for free. This project can be credited with the majority of the city’s water savings and it also provided jobs and engaged the community. Next, Los Angeles will tackle water usage for landscaping, at citywide level as well as for corporations and individuals. The plans include installing smart irrigation systems in parks, diverting more treated waste water from the oceans for outdoor use, and creating more green space with native trees and plants to absorb storm runoff to stave pollution of the ocean and the region’s groundwater. According to Sutley, “LA hasn’t spent a dime in 15 years on expanding freeway capacity.” Instead, the city has focused on building carpool lanes, making the city more bike-friendly and expanding public transport. Over one million people use LA’s public transit every day and the MTA has the largest fleet of compressed natural gas buses in North America. The goal is to move away from diesel buses entirely by 2008. Massive expansions to the light rail and subway system are also on the docket, including the hotly debated Subway to the Sea project. Los Angeles produces 8,000 tons of garbage every day. With limited landfill space, LA was an early pioneer of curbside recycling. Currently, 62 per cent of waste is diverted from landfills and the goal is to increase that percentage to 70 per cent by 2015 through increased recycling programs and proposals to divert green waste to ethanol production facilities. Many other projects are underway to help green Los Angeles and make the city more liveable by creating more park spaces and building community. As we’ve reported before, the LA River is undergoing a massive revitalization. This program began as a grassroots effort and recently, the city announced a 20-year plan to remove concrete from much of the river, add bike paths and parks and make the way for new real estate development. The goal is to bring the river back to the people of Los Angeles. • Many of the one million new trees will be planted by City departments on public property. Others will be planted throughout the City by individual volunteers, community groups, organizations, and businesses. • Million Trees LA is a cooperative effort between the City of Los Angeles, community groups, businesses, and individuals working together to plant and provide long-term stewardship of one million trees planted where they’re needed most. • Million Trees LA will take several years and build on other programs that plant and care for the urban forest. • Trees that maximize sustainability  with a preference on native and drought tolerant species  are recommended. Asking the residents of LA to adopt a tree may seem like more of a marketing campaign than a real substantive environmental effort. But Million Trees LA is a real strategic effort toward building a greener city. Planting will be guided by this information with an emphasis on schools, underserved communities, transportation corridors and areas along the Los Angeles River. The Mayor’s Office’s goals are not limited to greening Los Angeles, improving its economy and making the city more liveable for its residents. Deputy Mayor Sutley also aims to share successes and create standards for other cities. “Cities are all basically the same,” she said. “We all have to deal with roads, water, energy and waste.” Because national and international governments can be slow to act, mayors of cities worldwide are collaborating to take matters into their own hands. “Cities are the first responders. If climate change causes more local forest fires, we have to deal with that on a city level. We can’t afford to wait for national or international action.” Nancy Sutley represents Los Angeles in the Large Cities Climate Group, an international organization of mayors founded in partnership with the Clinton Global Initiative. As an Angeleno, it can be difficult to feel connected with your fellow city-dwellers. The city is broken up into disparate neighborhoods and driving from one to another, you often feel like a tourist rather than a local. I hope that the initiatives from the Mayor’s Office will help bring the communities together in a shared vision for a greener LA. As Los Angeles increasingly becomes a model of sustainability for other cities, it will build a green identity for itself and give its residents something to rally behind. The first elected from its majority Latino community, Antonio Villaraigosa was elected the 41st mayor of Los Angeles on 17 May 2005 when he beat incumbent James Hahn in a run-off vote. Though seen as a competent mayor with 24 years of elected office behind him, the city’s Afro-American voters were seen to punish Hahn over his dismissal of LA police chief Bernard C. Parks in a low turnout poll, electing fellow Democrat Villaraigosa. 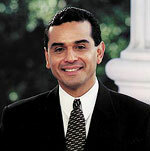 Snr Villaraigosa unsuccessfully sought the mayoralty in 2001 but has held a variety of elected posts, including as a state assembly member. Born in 1953 as Antonio Villar to a Mexican father and mother of Mexican descent, his upbringing was blighted by acute poverty, his father’s alcoholism and domestic violence  to this day he is not in contact with his father. He now says he feels he has no need to defend his expensive tastes in clothes, given his childhood years. He was expelled from high school for fighting and became a civil rights activist at just 15, campaigning alongside Cesar Chavez. Although the young Villar was to come into contact with the city’s notorious gang culture, a tutor at East Los Angeles College paid for him to take his SATs. Villar’s passion for activism remained with him at college, where he led protests against the Vietnam war. Having graduated from UCLA with a degree in history, he also obtained a doctorate in jurisprudence from the Peoples’ College of Law.